Washington, NJ: The Witte 400 vibrating fluid bed dryer-cooler-classifier from process equipment manufacturer The Witte Co., Washington, New Jersey (www.witte.com), reduces the temperature of plastic pellets from 100 degrees C to 50 degrees C at up to 5,000 lbs/hr. using ambient air. Integrating drying, cooling, dedusting and classifying into a single, compact unit, the Witte 400 removes residual moisture that may condense during packaging, separates minus 20 mesh “fines” to pass the “hand test”, removes minus 10 mesh chips and then removes “oversize” material, yielding consistently on-spec pellets for clog-free bag filling and packaging. 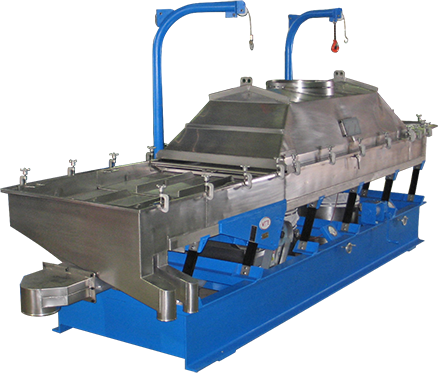 The Witte 400 is ideal for processing nylons, polyesters, polyurethanes, polystyrene, polyethylene, polypropylene, polyvinyl chloride, and other commodity and engineering resins. The self-contained plastic pellet system opens easily to expose the interior for cleaning and inspection and is available with a motorized, hands-free safety hoist, a choice of steam, gas, or electric process air heating systems and a variety of custom options. The Witte 400 is manufactured at the company’s New Jersey headquarters and fully assembled and tested before delivery.